Our largest project for sea turtle conservation is conducted at the FPL St. Lucie nuclear power plant. At this site, large pipes transfer ocean water to an intake canal at the power plant. Oftentimes, sea turtles swim into these pipes and enter a secure area of the intake canal which is roughly the size of a football field. FPL has employed biologists to conduct sea turtle research at the St. Lucie intake canal since 1976, and Inwater Research Group has overseen the capture, data collection, and safe return of these sea turtles back into the wild since 2009. Access to these turtles has provided a tremendous amount of opportunity for conservation research. Since the program’s inception, over 17,000 sea turtles have contributed to this important portrait of sea turtle life history. Each turtle is given a thorough health assessment, weighed, measured, tagged, and photographed before being released back into the ocean. Inwater Research Group scientists, along with many other agencies, have used the data gathered from these turtles to help answer many questions about Florida’s sea turtles about abundance data, population trends, human and natural threats, growth rates, migratory patterns, and much more. IRG has also had the opportunity to collaborate with many colleges and universities to collect other data, such as blood, biopsy, and lavage samples, in order to look at questions about the genetic origins of individual turtles, baseline blood chemistry values, stable isotope analysis, and more. 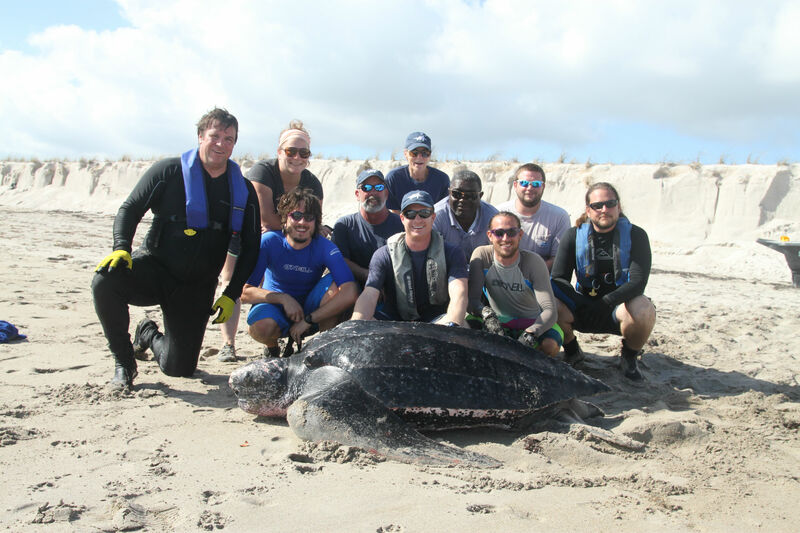 One of the most interesting aspects of this program is that it has allowed our biologists access to all five species of sea turtles that inhabit Florida waters: loggerhead, green, leatherback, hawksbill, and Kemp’s ridley sea turtles. Whereas most sea turtle research is conducted on nesting beaches, and therefore researchers only have access to adult female and hatchling sea turtles, we have collected data from a variety of different size classes: juvenile, sub-adult, and adults, as well as both male and female turtles. The program also provides a vital opportunity for sick or injured sea turtles to be transferred to rehabilitation centers until they are healthy enough to be returned back into the wild. Since 2009, 142 turtles have been taken to rehabilitation centers for fishing line entanglements, heavy fibropapilloma tumor loads, boat strikes, shark bites, cold stunning, and a variety of other ailments. Many of these turtles would most likely have washed up dead or too sick to be rehabilitated if they weren’t captured at this in-water site. In addition to the sea turtle research conducted at this site, IRG is also involved in the capture, tagging, and release of a variety of elasmobranchs (sharks, skates, and rays) and teleost (bony) fish. We have acquired specimen for many aquaria, such as the collection of three large, roughtail stingrays captured for the Georgia Aquarium. We have also collaborated with a variety of researchers including biologists at Florida State University who are studying goliath groupers.